There are plenty of official Windows Themes, problem with them is they do not completely change the appearance. Though they are easy to install (just a click needed) but only selected elements change after applying new themepack. Windows 7 Theme Packs change the aero transparency and color, Sounds and Wallpapers but what if you want to completely redesign the appearance of Windows. Windows 7 has inbuilt protection which doesn’t allow 3rd party themes installation by default. First of all, we need to patch windows system files responsible for UI and themes so that they allow theme installation. UxTheme patcher can do this one click. Just Run this program as Administration and press Patch. Note that original files can be restored in case you run into error as they are backed up already. Download theme you want to install. It is generally in ZIP or RAR format which you have to extract in a folder. It contains a folder with shell style and other necessary elements and .theme file. Copy the folder and .theme file to C:\Windows\Resources\Themes and Make sure that the names of folder and theme file are exactly same. Now, Right click on Desktop > Personalize > Themes and you’l notice new division tagged as Installed Themes which can be applied just by click. In some cases, it is possible that Theme contains other dll files which needs to be replaced from System32 folder to apply theme completely. Make sure you backup original dll files before replacing. You will need to take ownership while performing operation on Windows\System32 folder. Start orb Changer – Some themes provide Start Orb BMP image (Start button image) with theme and to change that use 7 Theme Source Patcher. To replace default system icons with the icon pack provided with the theme, use Icon replacer to suit the theme. Hi thanks for sharing this information. 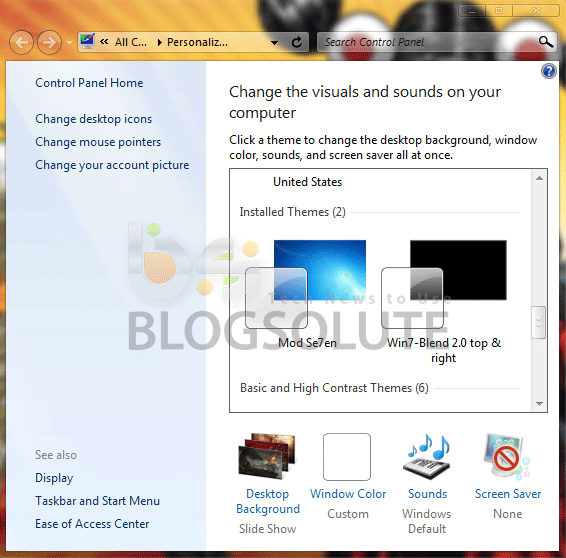 More nice themes for windows 7 are available from website like deviantart.